This week of Target Style is all about fun graphic T’s and my favorite “Boo your neighbor” tradition. It doesn’t have to be the holiday season to remind your kids to always have a giving spirit. I like to find fun traditions throughout the year that reminds my two kiddos that you should always think of others. As Halloween approaches, it’s the perfect time to “Boo” your neighbor. While it’s about catching them off guard, it has everything to do with making them laugh instead of scream in fear. Here are the steps on how to “boo”: First, you’ll need a container. A bucket works best because it provides for a better presentation of its contents. Target or Dollar Tree will have a large selection of these. Next, it’s time to fill your bucket with goodies. While kids try to get as much candy on Halloween, the items that go into your “Boo Bucket” don’t necessarily have to tame the sweet tooth. I like to include stickers, games and other non-food items that will entertain them. A good cost-saving strategy is to purchase your Boo supplies right after Halloween the year before because everything will be on sale. 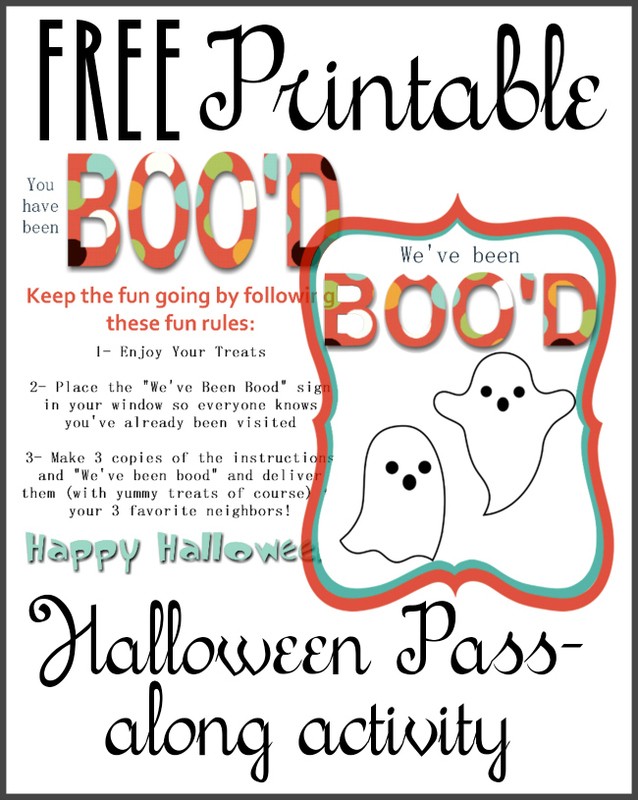 Lastly, include a flyer that describes what it means to get “booed”, and what your neighbors need to do next. They’re instructed to first put the “I’ve been booed” sign in on their door. Next, they’ll need to boo two other neighbors. Now it’s time to head out. To get your kids excited, explain that this is a “top secret mission” and they must be super quiet as to make sure the neighbor doesn’t hear them. Make sure to wear dark clothing so you’re not spotted, but take a good flashlight. Get in a good viewing spot where you’re close to your target house, but also where you can’t be seen. When the coast is clear, run to the door, ring the doorbell drop the bucket of treats and then take off as fast as you can back to your hiding spot. Watch the door to see if someone opens it, and finds the Boo Bucket. It’s fun to watch your neighbor’s reaction to such a fun surprise. Repeat the process for your next neighbor. In the following days, your kids will be checking the door every hour to see if you were booed. The best is when you’re home and get booed, and try to guess who was the sneaky neighbor. This is a sure-fire activity to get your kids even more excited about Halloween, and you’re also teaching them an important lesson about giving. Soooo the big question was what do we wear to the Living with Landyn Live show? Here is what we ended up wearing. We wanted layers because sometimes those facilities are freezing with the AC blasting. We opted for fall colors and booties. The weather has cooled off in St. Louis so I’m obsessed with getting my boys outside as much as possible. Many nights we will take our dinner to a playground or park and enjoy the outside while we eat. Being a working mom, I don’t have loads of time with my boys so I try to find ways to make our time together special without a lot of work. Keep a blanket, towel, even your yoga mats in your car so you can be spontaneous when you’re in the picnic mood. If packing food isn’t an option and you’re not in the mood for fast food, we like to get “grab and go” from The Art of Entertaining in Webster Groves. They have healthy options my kids like too. Mason is eating the Smart Start breakfast option which includes fruit, yogurt, and a popular mini muffin. Fill me in on how you like to picnic. Have fun enjoying your quality outdoor time. On a side note, my boys LOVE dogs. They want to pet every dog they see. I was recently looking for some cute graphic T’s for a family photo and found these adorable options.